Roger Federer has to be considered the greatest tennis player ever after winning his sixth Wimbledon final and fifteenth overall grand slam, a male tennis all-time record. Margaret Smith Court owns the female all-time record with 24. However, it wasn’t easy to break his tie with Pete Sampras (14 grand slam finals) as Federer’s opponent, Andy Roddick, gave it his all in losing the Wimbledon final, his third such defeat to Federer as Roddick also lost in 2004 and 2005. The 2009 Wimbeldon final was the longest tennis match ever at four hours and 16 minutes with the fifth set itself almost lasting an hour and a half. Federer won the match: 5-7, 7-6 (6), 7-6 (5), 3-6, 16-14. Wimbeldon doesn’t use tiebreakers in the fifth set. In any case, at only 27-years-old, Federer is well on his way to being the Tiger Woods of his sport - a player so consistently dominant that it seems almost unreal at how the level of excellence lasted so long and at a, relatively, early age. There are sure to be many more major titles for Federer, however, number 15 should well establish him as tennis’ best ever. As sports fans, we love and want to witness feats of athletic, methodical, and powerful achievement. The grace of Barry Sanders stopping on a dime, running back five yards, then going forward 80 yards while evading all 11 defensive players for a score was soemthing you felt lucky to see, mouth agape, drool making a half necklace around your neck. The devastating display of homerun power in 1998 as Mark McGwire and Sammy Sosa chase of Roger Maris and his single season home run record and the way they chased each other had even your grandmother paying attention to the home run race. And, how about Tiger Wood’s assassin-like taking of the PGA at the turn of the century, and most recently this past weekend at the British Open. Face it, folks, we want to know and be blessed with witnessing, to steal from LeBron James and Nike, the “big things” in sports. And, I’m here to help you all figure out what those things are. In a grueling five-hour, five-set match, Rafael Nadal defeated the number one seeded Roger Federer for the third time this season. This match has so many interesting tidbits to digest - not only did Nadal fight off two match points, this match also featured three tie-breaker sets. This was the championship match for the Rome Masters tournament, and the win gave the 19 year old Nadal his 16th title for his career, tying him with Bjorn Borg. Oh, Nadal tied a Men’s record with 53 straight clay court victories as well. Nadal has won nine straight tournaments on clay court. The loss by Federer gives him three for the 2006 year, all at the hands of Nadal. The clay court for non-tennis fanatics makes the ball move a bit slower which gives the faster players more of a chance to succeed against the hard-smashing, ace-serving big guys of tennis. In a semi-final match last night Maria Sharapova received boos from the crowd and a tainted victory over Tatiana Golovin. It is not often at tennis matches were the crowd outright boos a competitor, but that is what happened as Golovin made an impressive second set comeback down 5-1 at one point and forced a tie-break. Sharapova eventually won the match because Golovin was unable to continue due to an ankle injury. Golovin was leading in the third set 4-3 at that point. The boos came at the start of the third set, where Sharapova took an extended bathroom timeout which looked more like ploy to regain her composure after squandering a huge lead in the second half, and it appeared she was trying to slow down Golovin’s momentum. Sharapova will face Svetlana Kuznetsova, who defeated Amelie Mauresmo, to reach the finals. Sharapova is going for her second consecutive tournament win, the last even was the Pacific Life Open, where she defeated Elena Dementieva handedly. We all knew this was going to happen, after watching the American public oogle over tennis hotties Anna Kournikova and Maria Sharapova. Tennis is now trying to turn into a eye-candy sport to spur new interest from the top demographic, men of all ages. The next hot thing in the gossip columns maybe Jennifer Scholle. She first came on the scene to the publics eye during this past summers US Open, while James Blake made his comeback and eventually lost to Andre Agassi in the Quarterfinals in 5 sets, with the fifth set going into a tie-breaker. Scholle was on screen numerous times in between points during all of Blake’s matches. Anna Benson now has some competition on her hands as the most talked about woman in sports. I am not going to deny it, I was rooting for Sharapova to win the Australian Open. At least she made it to the final four and lost in the Semi-finals to Justine Henin-Hardenne in three sets. Henin-Hardenne is definitely not someone to be ashamed to lose to, she is a four time Grand Slam Winner. The reason I want Sharapova to have success is that I hope she doesn’t turn into the next Anna Kournikova. You know, as in the ‘Oh I’m good looking, I don’t need tennis, I’ll just be a celebrity’ type mindset that makes you stop being a great player. Henin-Hardenne will face Amelie Mauresmo in the finals. Mauresmo beat Kim Clijsters as she retired from the match due to an ankle injury. Clijsters gave it a good run, considering all the injuries she had to endure throughout the tournament. Roddick lost in the fourth round to unseeded Marcos Baghdatis in four sets earlier today. Baghdatis is a former junior world champion, so we may hear his name a lot more before his career is all said and done. Fans were hoping for a big name matchup between Roger Federer and Andy Roddick in the finals due to injuries to Marat Safin, Andre Agassi and Rafael Nadal and Aussie favorite Lleyton Hewitt being eliminated. Roddick and Federer had been in the finals of the previous two Wimbledons. Roddick can at least now take it easy and watch eye-candy super-star Maria Sharapova, whom he has been linked to. Others may speculate that Roddick is suffering from the curse of Lacoste, which he is sponsoring. In his 2003 US Open victory, Roddick was a Reebok spokesman. Australian native Lleyton Hewitt, the obvious fan favorite for the Australian Open, almost didn’t have a chance to make a long run in front of the home crowd. 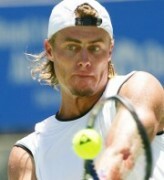 Hewitt needed a 3 hour, 45 minute five set comeback to defeat lesser known Robin Vik. Last year Hewitt made it all the way to the finals but lost to Martin Safin. Hewitt has yet to win the Australian Open in his career, just as England native Tim Henman is the crowd favorite for another major, Wimbledon. Interesting note, Henman’s best performance at Wimbledon was in 2002, where he made it all the way to the semi-finals but lost to eventual champ Lleyton Hewitt. The big time U.S. players to have already been eliminated are #10 Venus Williams and #13 Robby Ginepri, with second round matches almost completed. Be a gentleman Lebron, no need to kiss and tell. How touching, young millionaire athletes find a special friendship together. I think momma James would approve. She’s pretty cute, good job Lebron! Just keep your eyes on the court!